Some codes were marked H (history) but after resetting the codes they immediately come back. After resetting the codes both the passenger and drivers side would default to full hot. The passenger side is unresponsive to any input on the temperature ****. The drivers side is also unresponsive to input on the temperature **** and stays full hot - until I get down to 60 then it switches to full cold and if I increase the temperature setting back up it stays full cold. Meanwhile the passenger side is still full hot. First the actuator rotates clockwise roughly 90 degrees at a pretty fast rate - takes ~5 sec. It pauses breifly and then starts to step back counter clockwise rotating ~45 degrees in short bursts. This takes about 12 sec. Lastly it finishes the last 45 degrees counter clockwise at the same speed as when it moved clockwise. After all of this the same 6 HVAC codes have returned. At this point Bill Curlee has given me feedback and thinks the actuator has broken teeth. The other possible issue is that the actuator needs to be reindexed. Thankfully this is the corvette forum and there is a wealth of information. I used the following up to this point in order to gain visual access to the drivers side actuator. 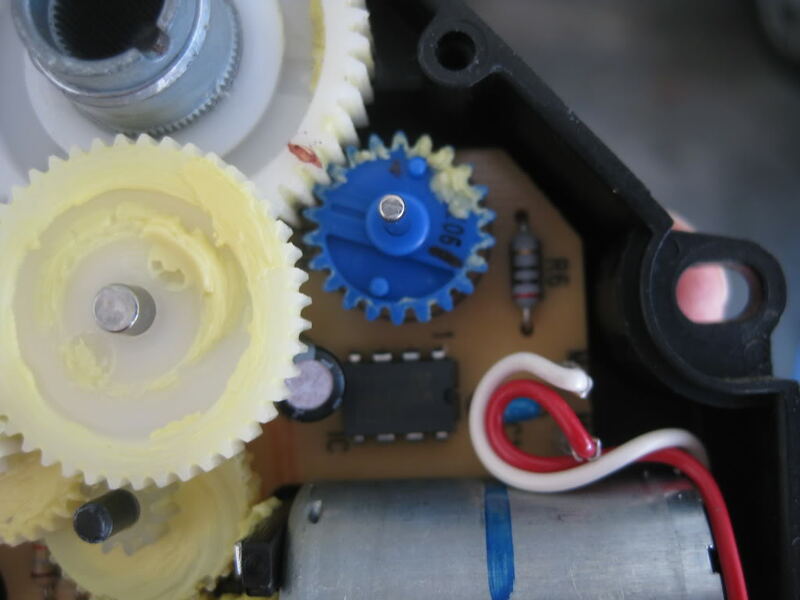 This link also has a great report on how to reindex the drivers side actuator which I use later on. Since I had issues with both drivers and passengers actuators I would need to remove the dash (only way to get to the passenger side actuator) and it would prove essential when attempting to repair the actuators since you need easy repeated access. Both have a cracked drive gears. In fact they were broken in the exact same fashion – one crack split wide open and one smaller crack. At this point my car is in pieces and I need two new actuators ($100+ each). I decided instead of buying and waiting for new actuators to arrive, to repair the cracked actuators. 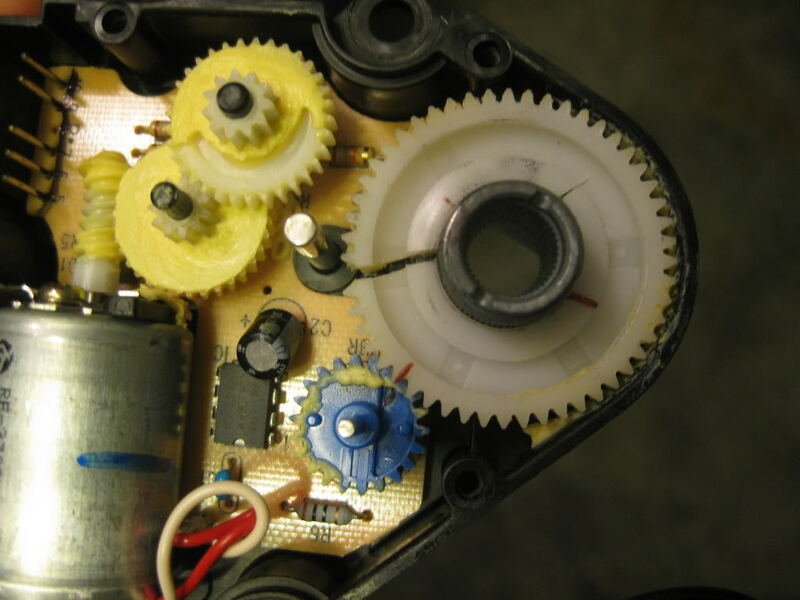 It appears they broke due to a manufacturing defect (clearly the hole in the middle of the plastic gear that was pressed onto the metal output shaft is too small of a diameter – by a significant amount – and therefore eventually cracked). It is possible that the new ones would have the same issue. 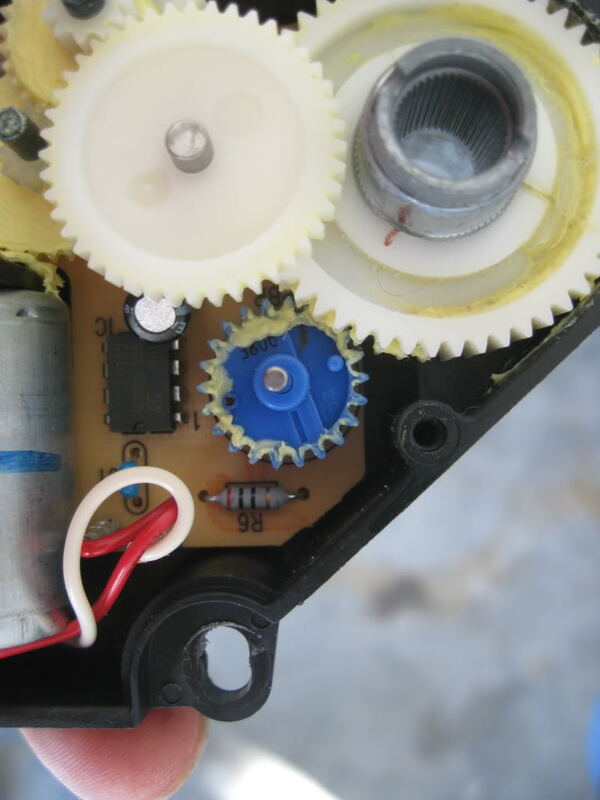 Therefore, I found the best solution was to fix the broken gear with a little epoxy. If you mess up the marks it isn’t a huge deal since you will have to reindex anyway, but it could help you reindex quicker. 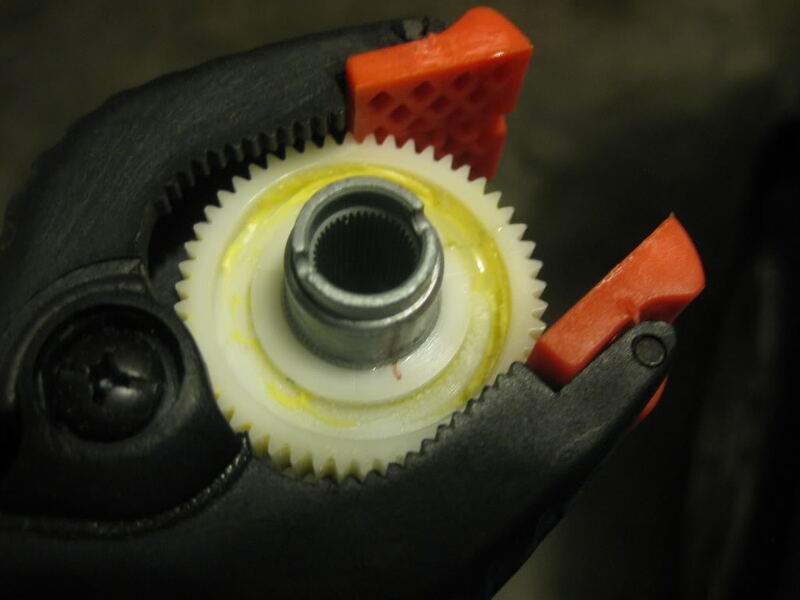 After removing the driver gear the first step is to slide the plastic gear off of the metal output shaft. 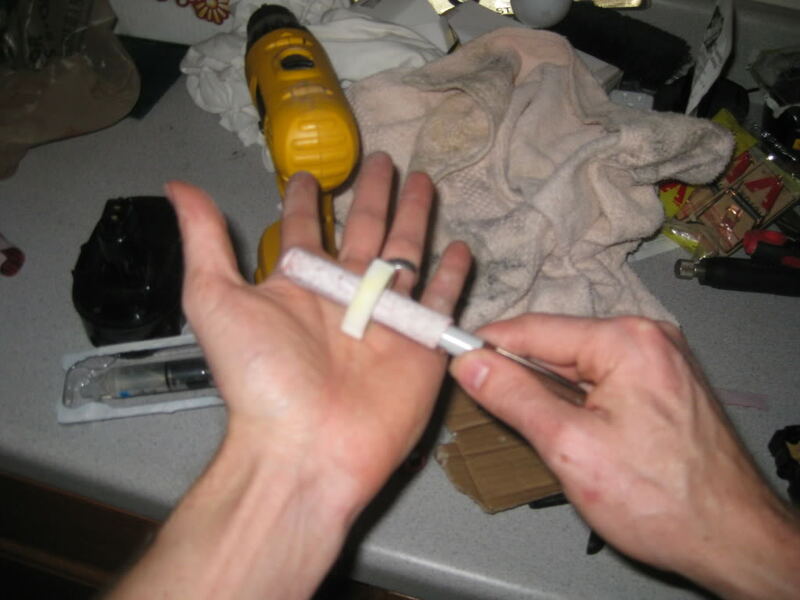 In order to increase the inner diameter I rolled some sandpaper onto a pen and then rolled the gear on my palm. This ensures that the inner diameter is uniformly sanded. I used 100 grit sandpaper since it cuts pretty fast and keeps the surface rough which is important for epoxy adhesion. After several test fits, I got it down to a diameter that snugly fit over the metal output shaft and the large crack was completely closed. Note: Instead of the iterative approach above to align the blue gear, you can use an ohm meter (about 10 posts down in this thread: http://forums.corvetteforum.com/c5-t...post1577439590). Hope this helps someone. Reindexing the blue gear relative to the drive gear takes some patience - at least in my case since mine was so far off - but eventually the codes did go away. I would like to thank those who contributed to the other great write ups that helped me access and diagnose my (previously) broken actuators. Last edited by cjcvette; 04-25-2011 at 02:25 PM. Fantastic post and a fantastic job. I am going to put this in my "Post that must be saved" file for sure!! Saving this thread for future use in case I end up with this problem. Thanks for taking the time to post this. With the actuator plugged in but not installed, i can adjust the hvac controls and the motor does not move. Im guessing indexing wont solve this problem and that either the motor or the circuitry is dead correct? My actuator would always try to rotate, even when it was throwing the codes. Yours does nothing even when you reset the codes? Those actuators list for near three hundred dollars at a chevy dealer!!!!!! Yeah. As long as the teeth aren't broken off you might as well just fix the cracked gear. Do you still have no codes using this fix? 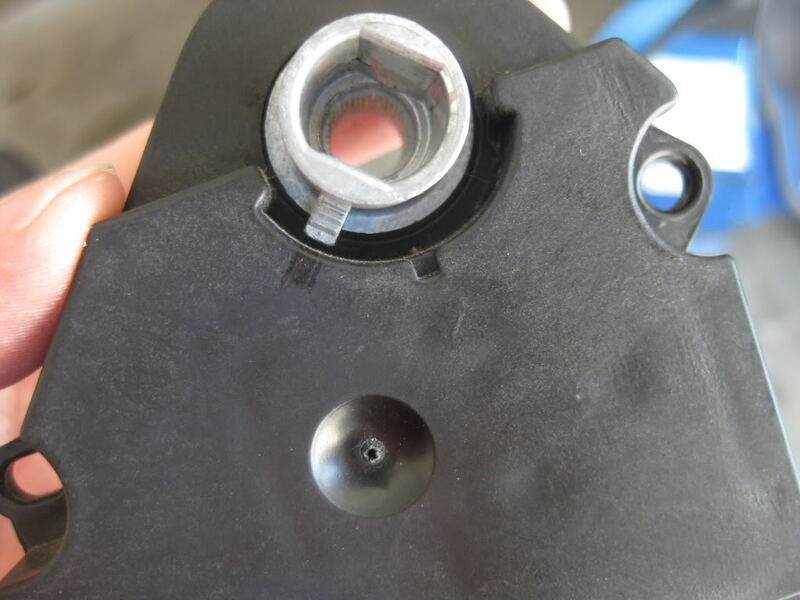 Excellent info for those who are fighting these nagging actuator issues. I'm updating my thread from several years ago with your link. I'm sure others will find it useful. Here's hoping I don't have to start a similar thread on my C6 in the C6 forums! No codes. Everything still works great! The codes B0365 and B0367 correspond to "right actuator feedback short to ground" and "right actuator feedback open." I'm surprised a broken gear would cause codes indicating electrical problems like this. I have the same codes and if the ignition is on I can hear the actuator grinding and whimpering in there non-stop. I will be checking the gears and trying your fix before spending $300. I just don't understand why the broken gear would throw those codes. The feedback circuit provides a output signal (basically controls the resistance to ground, given a 5 volt position signal voltage). The control head is expecting a voltage(within a range) based on the actuator position. If the gear is broken, and position drives full scale(allowing the resistance to drop to zero)..the control head sees that as a short to ground. I see. Good stuff Lucky. I pulled the passenger actuator appart expecting to see broken gears but found all to be like new so I disconnected the motor from the circuit board and connected it to a 9V battery and it worked fine. Next I tested the potentiometer 8,000 Ohms between pins 7 and 10 on the board and variabe resistance between 9 and 7 or 10 as expected. I put the driver side actuator on the passenger side and it worked so I pulled it apart and found it to be like new as well. I checked all the resistors, capacitors and the diode on the board and compared the values to the bad one and they were all the same. The only thing left is the IC OP Amp L2722 $1.33 from Newark or Digikey. I'll post when I get a new one installed, anyone else had this problem? I replaced the Op Amp yesterday and now the actuator works, I guess just dissassembling and reassemlbing the unit could have fixed it but for $1.33 why not try it. Great fix. Is there a good way to find out if the Op Amp is bad?